Alessandra, the second child of Cipriana and Nazareno, was brought up with spiritual and moral values. After a joyous infancy in Pisa and after traveling with her family to Austria, France and England, she finally settled down when she met Duncan, the son of a pastor whom Nazareno met during the war. Happily married, they have three children: John, Sheimas and Finley. 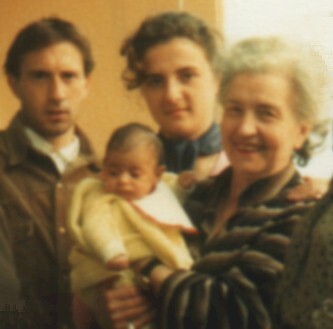 Here Alessandra is posing with brother Eugenio, little cousin Mariangela and nonna Angelina in 1980.